Almost 130,000 children are in supersized primary classes of 30 or more in the current school year. As enrolments to primary schools continue to rise, so too does the number of pupils squeezed into very large classes. About one-in-four children - or 24pc - are in classes of at least 30 pupils, according to latest figures from the Department of Education. While the one-in-four ratio has remained steady in recent years, the sheer growth in school enrolments means that more pupils are being affected. There is no immediate end to the pressure on schools. Primary enrolments are set to keep growing until 2019, to a peak of more than 574,000, a level not seen since the early 1980s. More teachers will be needed to cope with the ongoing growth and, if the next government continues the process of cutting class sizes, even more teachers will be required. At the other end of the spectrum, only 10pc of pupils are in classes of below 20, down from 14pc a few years ago. Large classes are more of a feature in schools in the extended Dublin commuter belt, as well as other areas that have seen an influx of young families over the past decade or so. Children in Carlow and Meath are most likely to feel the pinch, with more than 30pc of primary pupils in each of these counties in classes of 30 or more. Carlow also has the biggest average class size, of 27, ahead of the national average of 25. Even at an average of 25, Irish classes are the second largest in EU, after the UK, where teachers have classroom assistants to take on some of the load. The EU average is 21. Before the financial crash, progress had been made over a number of years in reducing primary class sizes. Back in 2008-09, the proportion of pupils in classes of 30 or more was down to 20pc, which then amounted to about 95,000 children. But austerity-era teacher cutbacks reversed that downward trend and classes started to grow in size again. Next September will bring some relief for overcrowded classrooms, following the move by Education Minister Jan O'Sullivan in Budget 2016 to improve the pupil-teacher ratio, the first such measure since 2008. 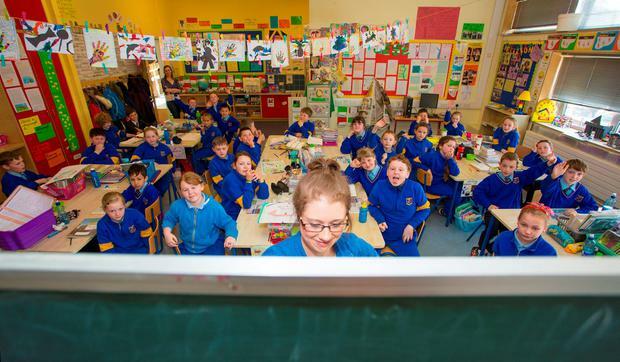 As well as providing for 865 new primary teachers to cater for additional enrolments in the autumn, a further 300 teachers are being recruited to reduce class sizes, bringing the national average down to 24. The Irish National Teachers' Organisation (INTO) has ensured that class size remains high on the political agenda with an intensive lobbying campaign. INTO general secretary Sheila Nunan said it was clear from the figures that the problem of supersized classes was getting worse. She said tackling the issue had to be a priority for the new government, and the scale of the problem needed a significant response. Ms Nunan said smaller classes made a difference to children, allowing them to get more individual attention from the teacher. "In smaller classes there are fewer distractions, each child gets more time and resources, and teachers can keep track of how each child is doing," she said. "On average, there are four more children in Irish classes than in EU classes."